The white sturgeon (Acipenser transmontanus), also known as the Pacific sturgeon, Oregon sturgeon, Columbia sturgeon, Sacramento sturgeon, and California white sturgeon, is a sturgeon (a fish of the family Acipenseridae) which lives along the west coast of North America from the Aleutian Islands to Central California. It is the largest freshwater fish in North America and is the third largest species of sturgeon, after the Beluga and the Kaluga. 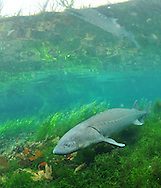 The white sturgeon is known to reach a maximum size of 816 kg (1,799 lb) and 6.1 m (20 ft). The largest sturgeon caught on record was caught on the Fraser River, in British Columbia, and weighed an estimated 1,100 pounds (498.9 kg) and measured 12 feet, 4 inches.